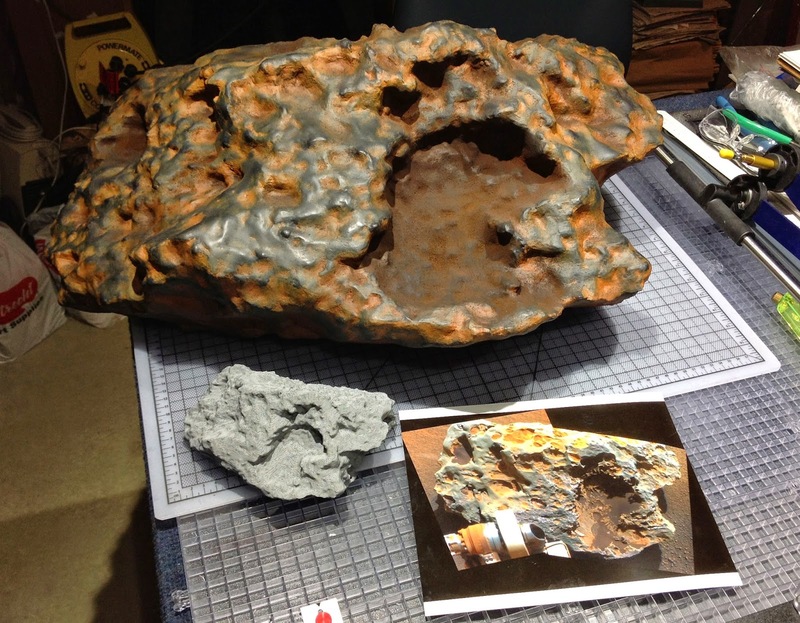 Last year, NASA scientists used a 3-D printer and panoramic images taken by the Opportunity Mars rover to reconstruct a plastic model of the largest meteorite ever found on Mars. Eleven years ago, a similar reconstruction featured in my short story about a Mars-themed amusement park, ﻿'Under Mars', published in Peter Crowther's Mars-themed anthology Mars Probes, and republished in my collection Little Machines. Getting harder to keep up. ﻿They walk through a crystal gateway into the next slice of the park's pie. Red rocks and red sand dunes saddle away into the trompe l'oeil distance of a painted backscene. Signs point towards the Viking landing site, the secret flying saucer factory, the Mars landing simulation, the life on Mars display. "It works in here," Homer says, tapping his head. "Focus makes the impossible real. It suspends disbelief. It makes fake reality as real as you and me. I was plugged into one of the NASA rovers, Buzz, travelling through Nirgal Vallis. I was on Mars." "You're on Mars right now," Buzz says, turning in a circle with his arms out, taking in the red sand (dyed Florida beach sand fixed into shape with resin), the pockmarked red rocks (each hand-carved from Arizona sandstone), the red crags (ditto). "I never did try it in the park," Homer says, "but I'm told it works just as well here as with VR." "You're serious about this stuff, aren't you?" "It's the real deal. When we're done with this little job we'll try it out. You and me, what do you say?" "I'd say you've done so much of this stuff you don't know what's real or not any more. Hey! Quit it!" Because Homer has grabbed Buzz's arm, is steering him off the main path. "I want to show you something," Homer says. Buzz pulls free. "Man, what's wrong with you?" "It won't take but ten minutes," Homer says stubbornly. Buzz knows better to argue. It's always been this way: Homer making up his mind, and Buzz going along with it. Homer is the go-getter, the man with the plan; Buzz is the sidekick. The path winds between bigger and bigger rocks, dives into an artfully simulated crevice in the arc of a crater's rampart wall. The room beyond is low ceilinged, red lit, and, apart from a bored docent lounging in the far corner, completely deserted. Tall glass cylinders are scattered across the black rubber floor, and Homer walks straight across the room to the largest, in which a red lump of rock half a metre high sits on a black display stand. "There," Homer says. "That there is real." "Come on, Homer. It's just plastic. A model." "I know that. I'm not fried. But it exists. It's sitting on Mars right this moment, in one of the canyons in Deuteronilus Mensea. A robot took twenty-eight days to scan that rock right there on Mars, and a laser stereolithograph used the information to build it up out of polymer. Look at it, Buzz. It's a fossilized stromatolite, just like the ones found in three-billion-year-old sedimentary rocks on Earth, which in turn are just like living stromatolites found in certain shallow bays of the Australian coast. See the striations, like pages in a book? Each one is a layer of sediment trapped and stabilized by a year's-worth of growth of mat-forming microorganisms. There was life on Mars, once upon a time. This is the hard evidence." As a bit of promotion for the paperback of Evening's Empires, Tom Hunter has interviewed me for London Calling magazine. If you're located in the UK, you might want to click over even if you're not interested in my blether, because there's a link at the end to a competition with a set of my books as a prize, as well as the chance to download, absolutely free, the ebook collection Stories from the Quiet War. Unfortunately, the offer isn't available to those outside the UK (although I guess that if you know how to spoof your location, you could grab the ebook . . .).